Follow the author and blogger Niki Brantmark as she tours the homes of others, as well as sharing sneak peeks of her own minimalist abode. She’s written books about Scandinavian design and the Swedish concept of lagom (which is all about filling your home and life with "just the right amount" of everything). Never too little, never too much. It’s the answer to clutter, and the key to a happy, balanced world. Imagine bringing the jungle from the outside in! This interior design account belongs to Justina Blakeney, a designer and artist who believes that creativity is the key to having a beautiful home. Her style is vibrant and bohemian, with a penchant for bold prints and tropical plants. If you love her design ideas as much as we do, take a look at our jungle wallpaper collection. She’s a style editor at Home Beautiful, and she also runs her own interiors blog. Follow her on the gram to check out her latest work, see where she’s travelling to, and pinch ideas for your next home design project. From wallpaper inspiration to the latest décor must-buys, her feed is the inside track to current magazine trends. Follow the amazing journey of Ashley Mayes as she renovates her family home, one post at a time. Her feed is inspirational yet achievable, and her house is totally liveable for families with children. And before you assume that it’s 24/7 staging glam, she even shares her thoughts on things like cleaning kitchen shelves. Because even the boring everyday chores need to get done in the real world. This Aussie interior designer seems to have a weakness for all things grey, all things brick, and all things concrete. A girl after our own heart. Her images feature simple design, but oodles of texture to keep it interesting. See our stunning concrete wallpaper range if her feed makes you want to add more texture to your walls. Say goodbye to boring bare walls forever. This London-based interior design studio shares photos of incredible, high-end homes and staging. Every Instagram post is a spectacular work of art. Awe-inspiring? Yes. Imaginative? Totally. Achievable? Probably not, but it’s still good to tease ourselves anyway. You don’t have to be a millionaire property owner to appreciate the finer finishes, and you’ll find plenty of ideas for your own spaces. A lovely Instagram account dedicated to interior styling by San Francisco based interior designer, Christina Higham. 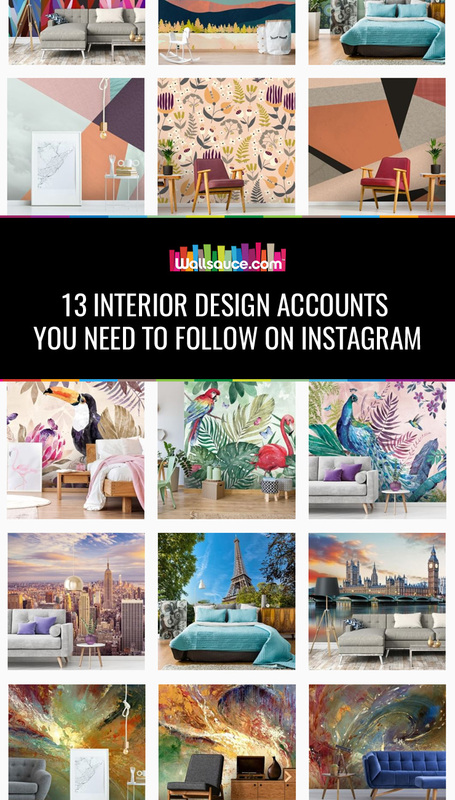 We’ve spotted some great wall murals on her feed, including florals, stripes and art déco patterns. But this fruit print wallpaper definitely steals the limelight. Love this bold look? Shop our fruity wallpapers to add an injection of colour to your home! If you’re obsessed with millennial pink interiors, make sure you follow Karen Pinkston on Instagram. Like us, she’s got a soft spot for floral wallpapers, particularly bougie-style roses. Gorgeous rose wallpaper can elevate a room and will add instant high-end glamour. Give your interiors the luxury upgrade for less with our beautiful rose wall murals. An award-winning, LA-based interior designer sharing everything from flooring and wall colours to furniture and rugs. Get a sneak peek inside the homes of her clients, as well as the home she shares with her husband. You’ll see a great mix of clean, minimalist living, with boho touches and Scandinavian-inspired hygge. PS. Her bathroom is to die for! Blogger Amy Kim has dedicated her site to sharing tips on minimal design and ideas for creative living. Her Instagram feed is a window into her lovely home, where monochrome rules and marble finishes are a common feature. Leafy green plants fill the contemporary corners of each room, and Amy manages to have things without clutter. She’s even written a blog post on how to jumpstart your organising and decluttering if you need some advice on that. Another haven for monochrome fans on the gram. The Edie Birds House account by Leigh Unwin tells the story of a family home transformed to be as hygge as hell. Black and white patterns, framed posters and geometric pieces make every room pop. And the white brick tiles are 100% Nordic chic. Enter the minimal world of a Swedish interior blogger living in London. Melia of Contemporary Life has already been named one of the top Instagram accounts to follow by British Vogue, and we can’t get enough of her photos. Her design style is typically Scandinavian, following simple rules for clean, uncluttered living. But don’t let those minimalist roots fool you. Prints are also welcomed in Melia’s home, and her appreciation of patterned wallpaper makes us grin from ear to ear. A dreamy feed bursting with pretty pinks, champagne hues and faux fur goodness. Follow this account for daily interiors inspo, geared towards those who want their homes to ooze modern luxury. From rose flower wall murals and bougie-looking cushions to giant chunky knit throws, every post will have you swooning over the elegant designs. For a chance to get your interior design blog featured, leave a message in the comments box below. Don’t forget to follow us Instagram where you can find more design ideas and customer photos.